Mesa, AZ January to March to Bill Haynes and Dave Wilson - C2, C3a and some C1. Milwaukee, WI June for the AACE convention. Mesa, AZ January to March we danced regularly to Randy Dougherty, Bill Haynes and John Steckman mostly at C3A and some C2. The sudden death of John Steckman the first part of April was devestating to all of us in the square dancing community, to say nothing of the loss to his family. He will certainly be missed by so many of us. Additionally, Randy Dougherty will be calling in Texas in the future. Dave Wilson came to Mesa in November to call the higher level dances with Bill Haynes through December. Mesa, AZ Back to Mesa for the dancing blitz put on by Bill Haynes and John Steckman in October and November. Lots of great dancing. Milwaukee, WI June for the AACE convention. Great callers as usual and visited with lots of friends. Mesa, AZ January to March dancing to Randy Dougherty, Bill Haynes and John Steckman mostly at C3A and some C2. Mesa, AZ November 2007 See the Mesa Square Dance Page for callers and schedules. We were back in Arizona and danced briefly before leaving on an extended trip in November and December. After visiting with friends who planned to attend this dance, we decided it was a good idea also. The Yorktowne Hotel was the site of this dance. The hotel was quaint and somewhat tiny, but the callers and dancers were great--we enjoyed both. The town was briefly the capitol of the country when Philadelphia was occupied by the British during the Revolutionary War. One of our summer destinations was the AACE (Academy of Advanced and Challenge Enthusiasts) Convention. Great callers and good dancers made this an enjoyable square dancing event. After the first of the year, the number of square dancers increases tremendously as they stream in from Canada, the Midwest and many other spots around the world. It's a good time to be dancing here. We were sort of conned into learning C3A, so we struggled with that. After a few years we'll get the hang of it, I hope. All the usual dancers back here as we settle back into a square dance routine. Its nice to get our feet wet once again in this activity we enjoy so much. Good dancing once we arrived at this convention--they changed the location without our knowing it.! Dancing is in full swing in January when the influx of after holiday dancers begins. We missed a few weeks while on our Antarctica trip and then when recovering from our Argentinian bug, but otherwise danced regularly to the likes of Randy Dougherty, Bill Haynes, Mike Sikorsky and John Steckman. You can't beat that lineup. We returned to Gilbert in early October so were able to start early with dancing when most callers began the season. Nice to get back into the groove and clear out the cobwebs grown in several months of not dancing. We danced C1 at McCloud and enjoyed visiting with friends there from California, Oregon and Washington. The 54th National Square Dance Convention was held in the Northwest again. The dancers came from all over, but once again their numbers were diminished. We enjoyed dancing with friends from California whom we hadn't seen in quite a while. We spent a good deal of time visiting with folks, which was very enjoyable. The dancing was good, even though the Challenge room was carpeted. The Academy of Advanced and Challenge Enthusiasts (I think) was held in Louisville this year, so we decided to park our motorhome in California and hop a plane back there for some dancing. Well, no one told us these dancers had eight hours of dancing each day. When they say "enthusiasts," they mean "ENTHUSIASTS." Anyway, we had a good time and came away thoroughly humbled. With the annual influx of dancers during these months, the level of calling (if not dancing) rises up to meet them. We enjoyed the challenges offered at all the sessions. Most of all, of course, we enjoyed the dancers. We have made so many new friends and get to reacquaint with folks we have danced with for years. Square dancing certainly does offer something special. Getting back to C2 dancing after a summer hiatus wasn't as easy as returning to levels we had danced for years. We eased in and tried to dance as many sessions as possible to jog our brains back in gear. This was the Last Hurrah for this lively convention. The nine national callers included many of our favorites like Bob Baier, Randy Dougherty, Tony Oxendine and Jerry Story. It was a lively crowd with memorable calling. We enjoyed dancing with friends from California, Nevada, Illinois, Michigan, Missouri and Pennsylvania. It was one of those weekends you didn't want to end, even though your body couldn't take much more. On Sunday before the convention started we pulled into the Denver RV Park, which was actually in Aurora and marked time reading and relaxing for a couple of days. Wednesday night the dancing began, and we didn’t rest again. It was great to reunite with friends from California, Washington, Nevada, North Dakota, Colorado, Missouri, and Texas. Less than 9,000 dancers attended this convention, but we enjoyed dancing to callers from around the states and Canada that we seldom see. We tasted humility when we tried our newly learned C2 to the likes of Mike Jacobs and Randy Dougherty, but we loved it all. We'll be ready to do it again in Portland, Oregon next year. Once we settled into our new home in Gilbert, we finally got around to some dancing in Mesa, which is the reason we bought a home here in the first place. Since we were trekking around in the Northwest after our Yellowstone visit, we decided to do a bit of dancing and arrived in McCloud in time to catch Bob Baier's A2 week. Bob kept us all entertained and dancing happily for five days at the foot of Mt. 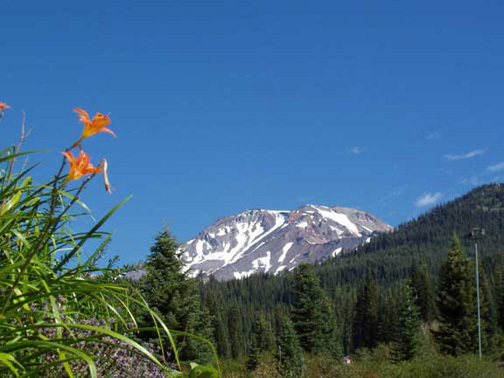 Shasta, with marshmallow roasts, pot lucks, dinners and the ever-popular skits. As always, we enjoyed dancing and visiting with old friends and making new ones. Unfortunately, this was Bob's final week calling at McCloud, so we were happy to participate in this "last hurrah!" Bronc Wise called a great A2-C1 weekend in the Gold Country. A Canadian caller whose name escapes me was the second caller at this dance where we were able to see lots of old friends. We are enjoying our fourth visit to the square dancing mecca of Mesa. Although we attend some A2 dances, we have confined most of our floor time to C1 workshops and dances because we have embarked on the adventure of C2 lessons. We feel we should be able to do C1 in our sleep in order to justify taking C2 lessons. We are once again enjoying workshops and dances given by Randy Dougherty, Bill Haynes, John Steckman and Mike Sikorsky. And the dancers are great-old friends and new friends-all enjoyable to be with. Bob Baier blew into town for his now annual Christmas Dance at the Pavilion. A great caller who always sees that you get your money's worth, Bob is also a really nice guy and good friend. Bronc Wise and Jet Roberts put on a great A2 weekend with Gary Carnes at this mini-resort near Hollister on the weekend following Thanksgiving. The dancing was very good, and the dancers were mostly old friends. Harlen Bowen handled the details for the package and did a bang-up job. Bronc Wise called a great A2 dance at the Pavilion for what used to be the Showcase night. Daughter Renee joined him, and we can't get over how grown up she is. We remember her when she danced in a backpack carrier on her mother's back when we were learning C1. We got to dance with lots of old friends and had a great time. We pulled into Mesa on the third of the month with the season in full swing. We are attending A2 Dances and C1 workshops and dances given by Randy Dougherty, Bill Haynes, John Steckman and Mike Sikorsky. We are enjoying the dancing and visiting with square dance friends from California and Oregon and making new acquaintances from all over. This annual event with callers, Bob Baier, Kip Garvey, Tony Oxendine and Jerry Story, was well attended with over 100 RV's parking around the halls at the fairgrounds. Jet Roberts was the guest caller again this year and was well liked by all. We danced in the C1 and A2 halls and enjoyed visiting with friends from all over and had a great time, even though the temperature dipped into the 20's at night. Bob Baier called the Christmas dance for a full floor of A2 dancers. We had a great time, as expected. Wish Bob were returning next year for this dance, but it isn't going to happen. Bronc Wise called a rousing A2 night for all who attended. We thoroughly enjoyed the dancing and greeting all of our friends there. We thought we had timed our visit here for the beginning of the season, but it turned out to be a little earlier than we had hoped, as several events were still dark. Nevertheless, we danced A2 with Mike Sikorsky and Randy Dougherty and C1 with Bill Haynes and Randy Dougherty. We had heard lots of good things about Bill Haynes, but this was our first opportunity to dance to him. It was very enjoyable. Hopefully we can return here after the holidays for some additional dance time. Mike Sikorsky's A2 DBD Week at McCloud Dance Country. McCloud, CA - July 28-August 2, 2001. We arrived on Saturday as square dancers were checking into the RV park. We settled in time to attend an evening A2 dance at the dance hall and to say hello to Mike Sikorsky and fellow square dancers. Sunday afternoon activities for the square dance week began in earnest with a dance and buffet dinner. So we settled into the routine of it all and just enjoyed the dancing, campfires, and camaraderie of old friends and acquaintances and meeting new ones. It was an enjoyable week, as are most square dance times. National Square Dance Convention. Anaheim, CA - June 27-30, 2001. The convention had an attendance of just over 13,000 folks from all over. We danced with people from Japan, Korea, England, New Zealand, Sweden, and, of course, from all over the U.S. Concrete floors are killers on the legs, feet and back, but we chose when to dance and when to rest, so it wasn't as bad as when we used to feel we had to dance every dance. We enjoyed dancing to some new callers and to all time favorites like Bob Baier, Daryl Clendenin, Randy Dougherty, Mike Jacobs, Tom Miller, Gary Shoemake, Mike Seastrom, Mike Sikorsky and Buddy Weaver. Our former club caller, Bob Elling, was there and some new favorites like George Monaghan and Cliff Simpson. A few thousand brave dancers went to Disneyland next door and did some outdoor dancing for the crowds there. We stayed in the air conditioned halls. Exhausting but enjoyable.